This beautiful old window has outlived the original frame, and has been reframed in a new pine frame. Removed from a house in LANCASHIRE ENGLAND ,during refurbishment.Circa 1920. 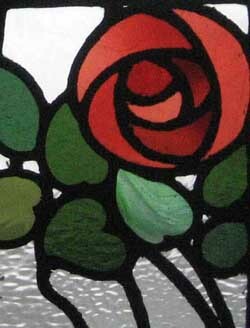 A window of outstanding beauty with exceptional coloured and textured glass. This coloured glass is of a heavy and deep texture. THE GLASS IN THE TOP PORTION OF THE WINDOW IS CLEAR SEE THROUGH GLASS AS CAN BE SEEN - I HAVE PLACED A BEAUTIFUL ROOFTOP PHOTOGRAPH BEHIND IT - IMAGINE THE VIEW IF IT WAS IN YOUR HOUSE. THE REST IS OBSCURE TEXTURED GLASS LETTING LOADS OF LIGHT THROUGH. The frame measures 29 W" x 53 H" . The glass measures 26 1/4 " x 50 1/4 " . Shipping and packing for USA would be $399. You can buy this now using the paypal link below the photograph or e-mail sales click here to arrange payment by personal check ,money order or bank transfer.